Go wild with a mouthwatering fruit-filled pie that's sure to have everyone asking for seconds. 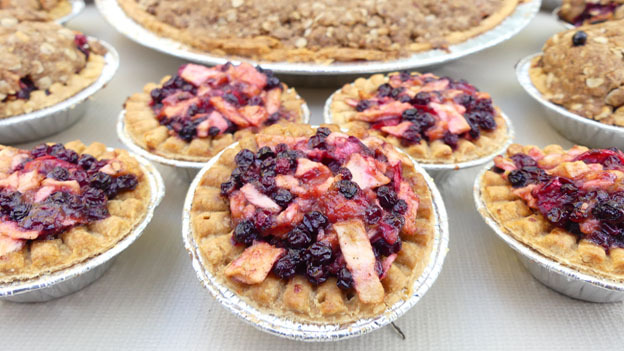 Served warm or cold, these healthy individual-sized fruit pies make a great grab and go snack! In a large bowl, mix apples, cranberries and elderberries. In small bowl, mix remaining filling ingredients. Add dry ingredients to fruit and blend well. Spoon into pre-baked pie shells. In small bowl, mix all topping ingredients except butter and pecans. Soften butter then add to the mixture. Once fully blended add pecans. Carefully place the topping onto the fruit mixture. Take pieces of foil wrap and cover the crust edges of the pie so that they do not burn while baking. Bake 35 minutes or until the fruit is tender and the topping is golden brown. If desired, serve warm with whipped cream or ice cream. You can make this recipe using pre-baked tart pie shells. Topping can be optional.